Pell Grants are the cornerstone of our national commitment to make higher education accessible and affordable. More than 8 million students who lack the financial means to attend college rely on Pell Grants. 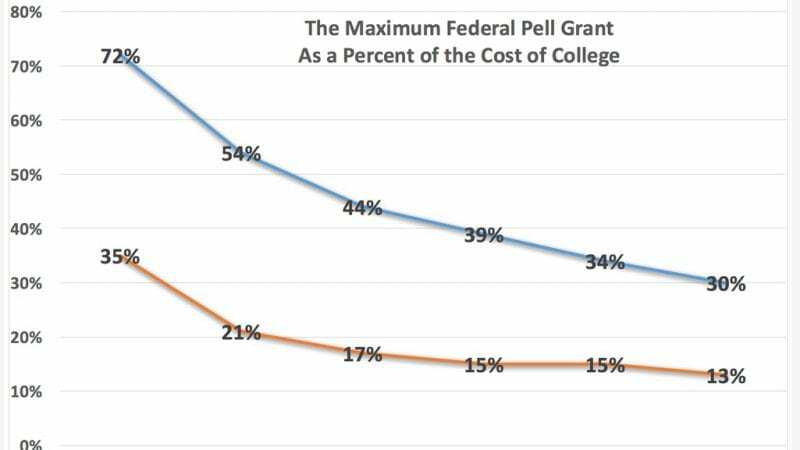 Yet, in 2015, the maximum Pell award was $5,730, less than one-third of the average cost of attending college–the lowest share in the history of the Pell Grant Program. The results are devastating: It is estimated that in the last decade alone, between 1.4 million and 2.4 million students who were academically prepared for college discovered that their bachelor’s degrees were financially out of reach because of inadequate Pell Grant assistance. UNCF believes that Pell Grants are an investment in Better Futures™ for African American students, and this investment must be strengthened if we want to bring higher education into the reach of additional underrepresented students. Increase the maximum Pell Grant by $120 to $5,935 for the 2017-18 academic year and to $12,000 over time, adjusted for inflation thereafter. RESTORE THE "SUMMER PELL GRANT"
Restore “Summer Pell Grants” to help low-income students earn their college degrees faster and at a lower cost. Summer Pell Grants are a second Pell award during the academic year to be used for summer classes. Provide a $300 Pell Grant bonus for low-income students who earn 15 credits per semester to facilitate college completion in four years. Lift the arbitrary six-year limit on the amount of time students may receive a Pell Grant, which does not recognize that at-risk and nontraditional students often need a longer period of time to complete their degrees. Raise the income level at which students can automatically qualify for the maximum Pell Grant so that more low-income students can get the support they need. Make an early Pell commitment to low-income high school students to increase college-going rates. Remove the current restriction on Pell Grant awards to individuals who are incarcerated in federal or state penal institutions to give them a “second chance” and an opportunity to earn the education and skills they need to be productive citizens.